Crazy hair can bring your outfit from normcore to wild and whimsical. We've known that from the very beginning of costume parties. Take Marie Antionette for instance, she drove her hairstyle to the max! Her wigs towered over her head, created by her private wig-artist. She not only intertwined a model ship and real pearls and jewels into the design but also powdered her hair different colors, depending on what she was wearing. Let's not pretend that woman were the only ones wearing crazy hairstyles, King Louis made it so popular that some judges still wear those rolled curls to this day! You don't have to wear any hot or heavy wigs when you want to transform your do' for your next costume, just use this spray on color. It contains three ounces of spray and washes out when you're ready to go back to your everyday look. Are you ready to transform? 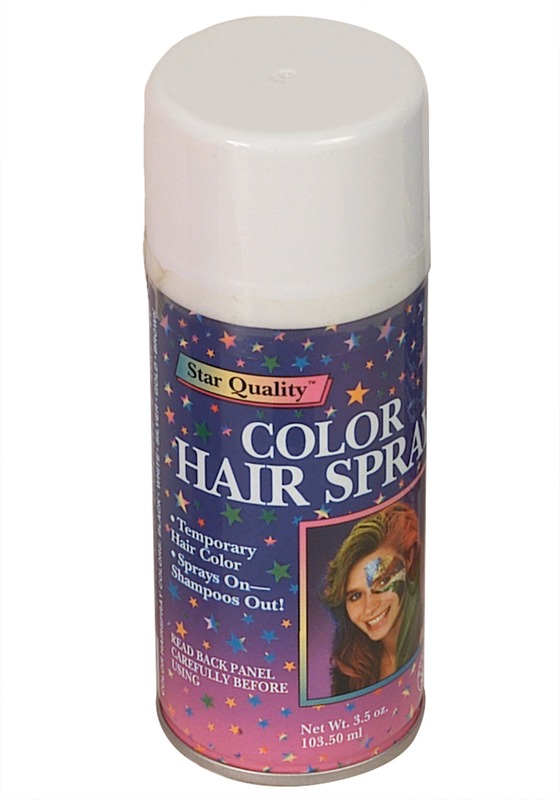 This white hairspray can turn you into an elderly character, a fancy Marie Antionette, or even a ghost that's looking to stir up some spooks. It's easier than ever to become a different character, you don't even need to hire your own private wig maker!